Hi there, I am new to Jot Form and hoping it can help me achieve something particular. 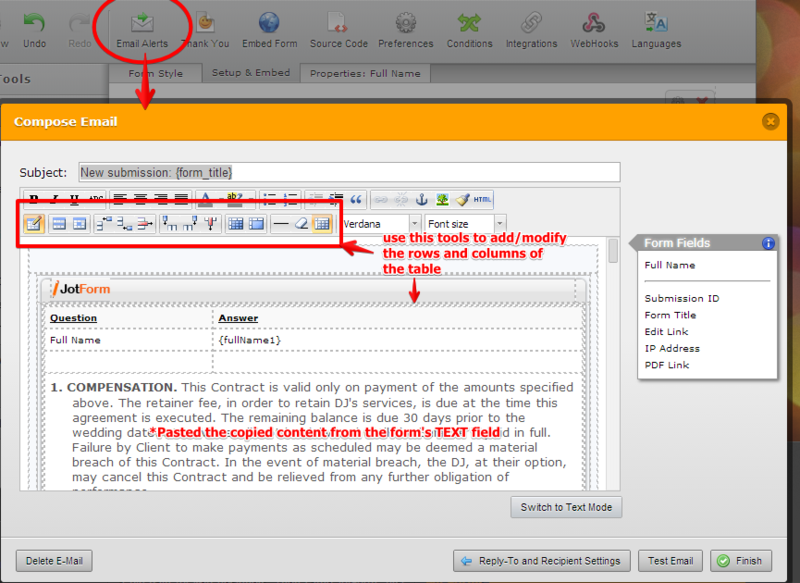 I want to use this form I have created for contracts, the issue is that the TEXT portions of the form are not emailed. I have researched it and tried varioius things, can't figure it out. How can I include the TEXT portions - which is the contract part of my form - within an email alert that is sent to me, and sent to my client. 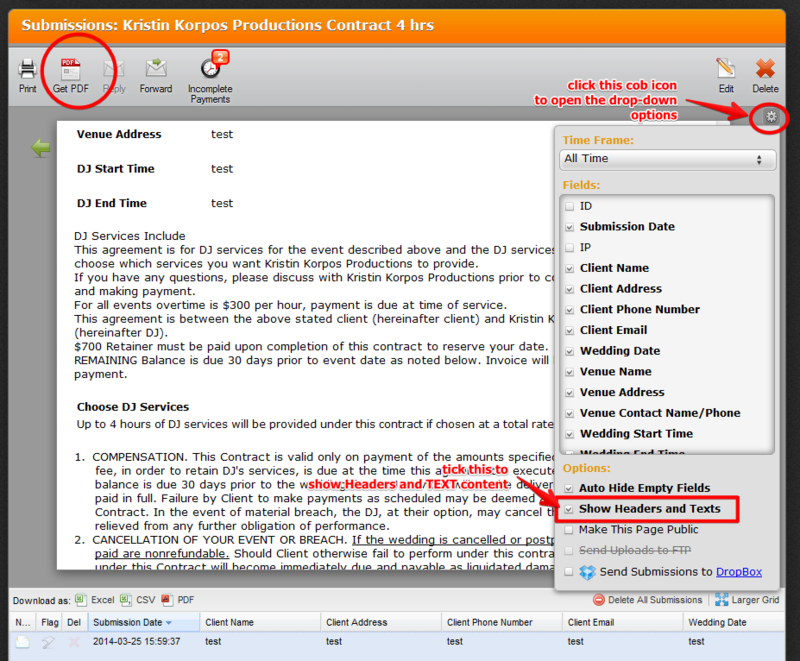 This way you see all answers to field questions, as well as text from contract, agreement and signature from client. Also, I want to be able to print out the PDF version with the text portions as well so that I have a copy of the contract for our records. I am going to sign it and then scan/send them a PDF of the finished contract. Seems like this should be achievable with our robust system. If it works for this business I will upgrade to use it with others. So far, lots of good stuff offered in your service, just need the basic functionality noted above which is probably there, just can't find answers. What you found out is correct. The TEXT field is not available among the fields that are in the form's e-mail notification. 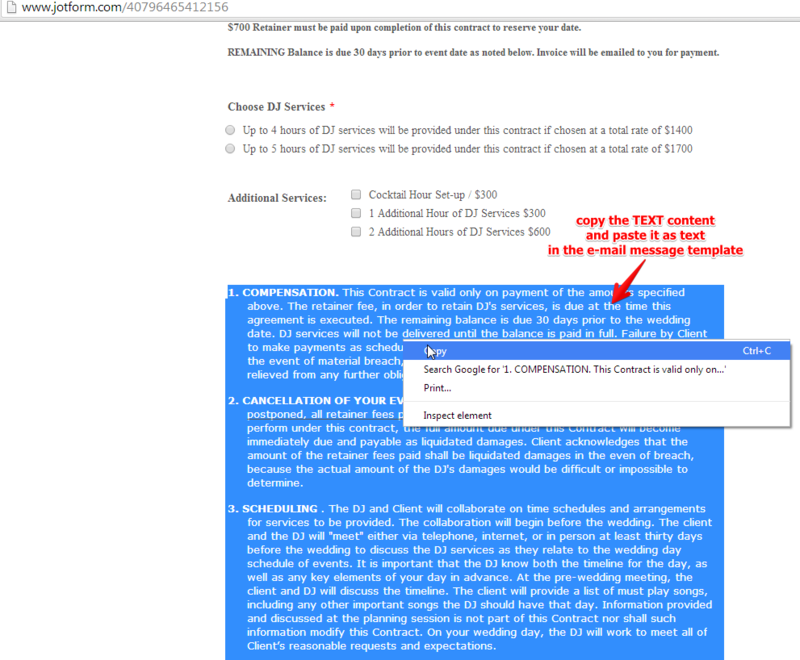 Here is test form you can try http://form.jotform.me/form/40837332925457? I have added an autoresponder e-mail. If you submit this form, you will receive the e-mail message with the TEXT content on the message. You can PRINT or Get PDF copy of each submissions for your hard copy of the record. Thank you for this thorough explanation, you guys rock!